Four new claimed and unclaimed terror operations in Egypt were reported, including a rare attack reported outside of North Sinai, in Egypt’s New Valley governorate. Three counter-terror operations were reported across Egypt, killing a total of 25 individuals. The Islamic State highlighted buffer zone formation on the Egypt-Gaza border. 274 Egyptians were arrested after attempting to cross the border into Libya. 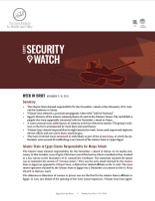 On February 5, the Islamic State claimed a rare attack against Egyptian security forces outside of North Sinai, targeting Egyptian police officers at a checkpoint along the New Valley governorate’s Baghdad-Luxor road. The last attack the group had claimed in the mainland was against Egypt’s Coptic Christian minority, claiming responsibility for the November 2 Minya attack. Other incidents in Egypt’s mainland, like the December 28 Vietnamese tour bus attack, remain unclaimed. That said, Egypt’s Western Desert has been an area where militant activity has been historically underreported, due to difficulties in covering vast expanses of land, increased military presence, sensitivity around border areas, and legal restrictions on reporting on instances of terrorism. The Islamic State’s electronic newsletter, al-Naba, covered a previously unreported January 24 Wilayat Sinai attack on tribesmen near Rafah. The report said that the ambush killed two tribesmen. The last Wilayat Sinai operation targeting the men—whom Wilayat Sinai describes as “Sahwa” forces, in reference to the U.S.-backed tribal militias in Iraq—was reported on December 14 and also took place in al-Barth. Sinai’s tribes have a complicated history with the Egyptian state but have been increasingly used as counter-terrorism partner. On January 28, Wilayat Sinai claimed responsibility for an improvised explosive device (IED) attack near the Arish airport. The two attacks bring Wilayat Sinai’s operational total up to 20 for 2019; Wilayat Sinai recorded 17 and 19 claims for November and December 2018 respectively. Social media reports of Wilayat Sinai setting fire to trucks and bulldozers on the site of development projects in Bir Gifgafa in central Sinai also emerged, though no claim of responsibility has been issued. A social media report said that Egyptian security forces conducted a raid in western Fayoum governorate on February 1, which reportedly killed 10 individuals alleged to be terrorists. On February 2, Egypt’s Ministry of Defense said the Egyptian Air Force, supported by ground forces, had killed eight individuals in the Western Desert. On February 4, Ahram Online reported that seven individuals, whom the government accused of belonging to Wilayat Sinai, were killed in an Arish raid. No direct official acknowledgment of the February 1 or February 4 counter-terror operations were available. In 2019, four of eight such raids have been reported in the news media without acknowledgement by the state. The Islamic State’s al-Naba newsletter published a feature on the Egyptian efforts to establish a buffer zone on the Gazan border. The article detailed the Egyptian tactics and equipment being used to clear structures throughout Rafah. The Egyptian military is establishing these buffer zones as cleared spaces in order to more easily defend surrounding areas and aid in IED detection. The demolitions associated with the buffer zone’s creation have displaced thousands of families, sometimes forcibly, and displaced civilians face inadequate access to services in new areas. Wilayat Sinai has resisted buffer zones’ formation, claiming to have destroyed 70 military bulldozers. In October 2018, the spokesman for the Egyptian armed forces said that Egypt has paid out 380 million Egyptian pounds in compensation to those affected. On February 3, 274 Egyptians were arrested after they tried to cross into Libya through Salloum. Previously, on January 21, the eastern Libyan government began construction on a wall along Egypt’s Salloum border crossing. It is well documented that criminal and insurgent networks have smuggled arms, people, and narcotics from Libya into Egypt since 2011, but Libya’s Tobruk government has also contended with the flow of Egyptians into its territory. As Egypt continues to crack down on the Muslim Brotherhood, reports of Egyptian Islamists crossing into Libya have been documented.